Summer is short – in Sweden..
That’s how it felt. Time was whizzing by, but what wonderful memories! The Cousins’ Week for instance with 6 of our grandchildren (and one little sister who was hanging around for part of the time). From the theme of ”The Big Five” – elefant, buffalo, lion, leopard and rhino we had wonderful times of sharing from the Bible and exciting talks. Other activities were painting with ice cubes, designing your own T-shirt, a full day in the adventures’ forest and of course the ”Shower Contest”. 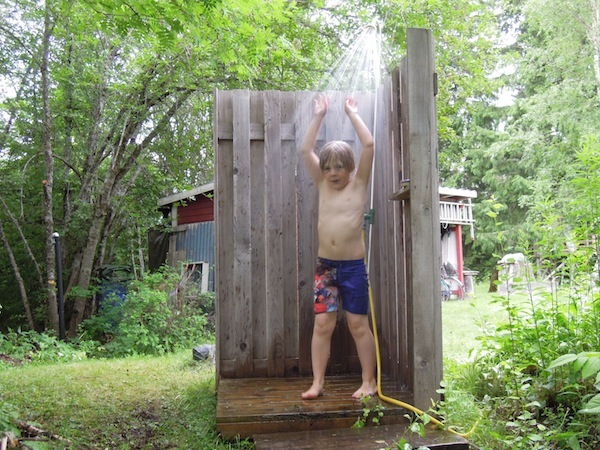 Contending with Grandpa for the maximum of cold showers in the outdoor shower! Yes that was truly a contest for money to the ice cream kitty! For every shower over and above granpa’s a dollar was added to the kitty. And conversely the loss of a dollar for every cold (and it was cold indeed!) shower that grandpa took. ”Shower, run a lap around the house, note on the list, shower, run around the house….! One day when each team, grandchildren vs. grandpa, had passed 175 showers, grandma said: Tomorrow – no showers! No big deal. The grandchildren gang had already tallied 250 crowns (40 USD) in the kitty! Kliff in full career for ice cream money! After some weeks at home – at our beloved Sunny Meadow – we set course for the south with plenty of stops on the way (yes we ended up sleeping in 7 different beds) and wonderful and interesting reunions with friends and supporters. Rolle with whom we spent our first 2 years in Africa. Anders and Birgit, Africa-fans and missionaries. 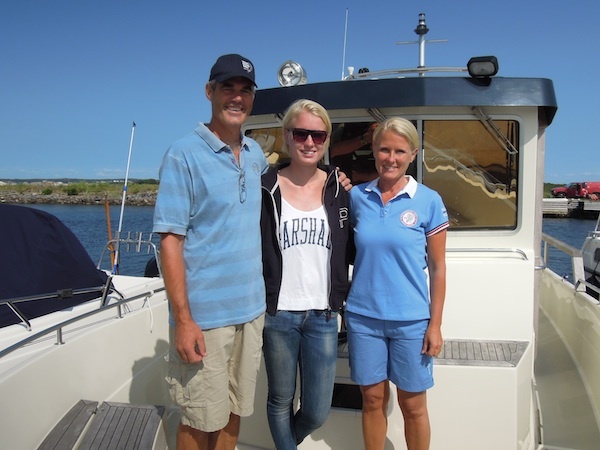 Leif and Solbritt Larsson, CEO of MAF-Sweden had us in for a delicious meal of pikeperch. An extended Sweet Memories Breakfast with Birgitta’s sister and husband Lasse by the Vänern lake. Three days with Erik and Maria on the beautiful archipelago island of Göteborg and meeting with some 50 supporters of our Turkana projects. A boat ride with Göran, Sara and Åsa – all 3 of them Loki volunteers. Onwards to Tommy and Karin, Birgitta’s brother and sister-in-law. Some days with Eva and Göran and a wonderful evening with some 30 friends with a special interest for the our ministry in Turkana. And Malin, aslo living in Malmö and our first volunteer for this fall, she offered us one of the best apple pies in town! Vimmerby is where we lived for 7 years. That’s also where the Astrid Lindgren, the famous children’s book author (Pippi Longstocking and many others), grew up and where you find Astrid Lindgren’s World. A splendid park with lots of settings from her books and where her world comes alive through plays and theatre. As a Swedish you’re quite impressed with the number of foreign visitors among those tens of thousands every day. To tour the park with our grandchildren Hugo, Bennine and Li was one of the highlights of this trip. Our last stop of our South Sweden Tour was late a Friday night with our dear friends Mai and Janne who were out with us in Loki in 2012. Over tea and a tremendous prawn-sandwich we shared many dear memories! 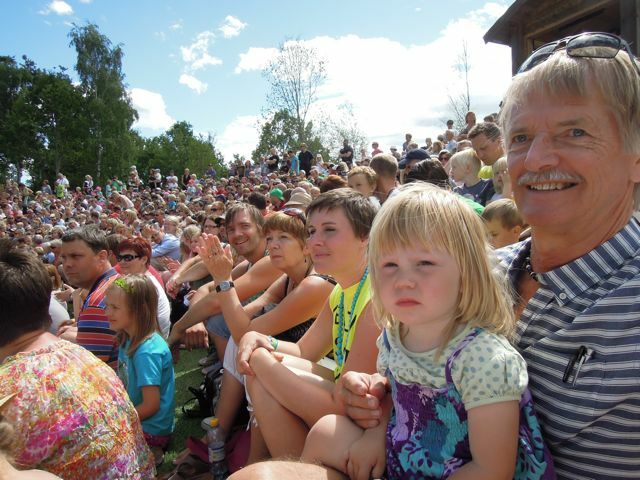 Amongst the crowds at the World of Astrid Lindgren – with Li in my lap! We had just disembarked from our international flight into JKA in Nairobi when we had news of the ANA-Hotel in Loki having been closed. For a number of reasons, (some of them quite disheartening…) the business just didn’t make ends meet. The bills and other losses exceeded the income. ”Mama” Birgitta was faced with the tragic challenge of having to say ”Stop!” No more trying for the ANA-group to run this business! It’s been somewhat a heartbreaking task to have to unravel what had been going on. 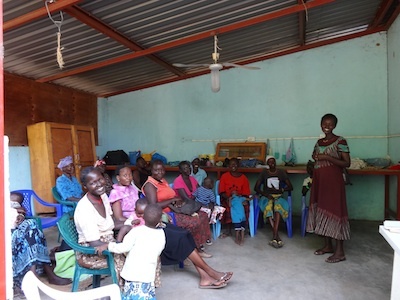 But it has also provided a chance to start building a new foundation for the women’s group, through intensified bible studies and prayers. On the contrary, the beading and bakery businesses are doing well and an increasing collection of jewelry is available for those who are interested. Check their website: Analoki.com. Two weeks of bible studies and seminars have started to bear fruit. 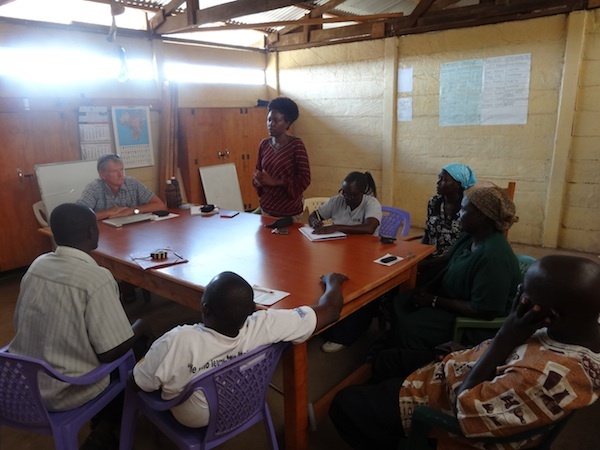 Sara, herself being a Turkana and a godly, mature woman, has been teaching the women, giving many examples from her own life. Sara with the ANA women! The outcome of the ANA-Hotel matter was finally a proposal to lease the premises and business to another women’s group called Ladybird. Most of these ladies are from other parts of Kenya and their common ground is previous experience with running businesses. The were very enthusiastic about the chance of taking over the business and ensuring that the good ANA-Hotell restaurant food continues to be available in Loki! As you can see our webpage has a new look. 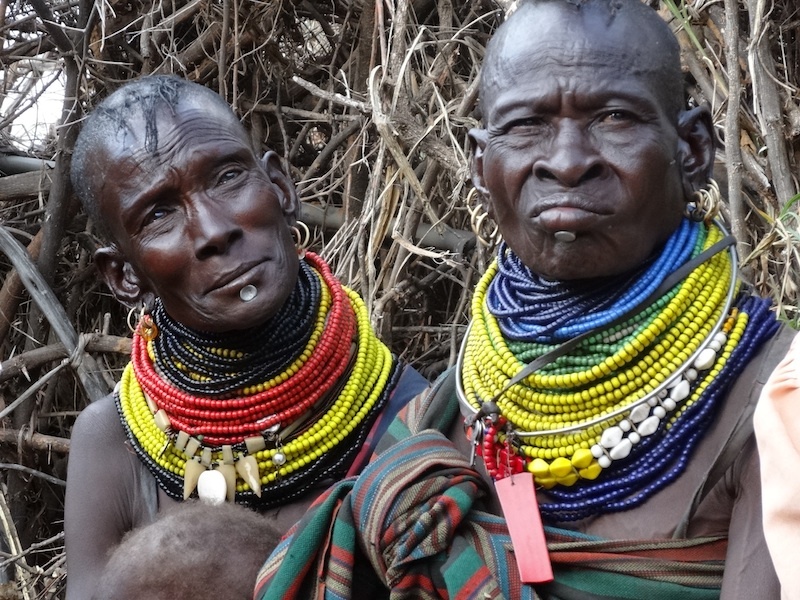 We hope to make it more user-friendly and keep updating it more frequently in order for you to continue being a part of the ministry in the Turkana! With every blessing from us! And a lot more has happened also! Francis at one of our latest latrines. 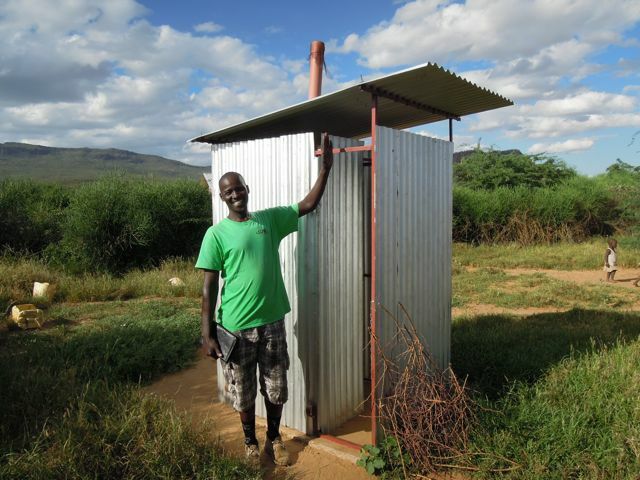 20 new latrines have been introduced in the community over the summer! 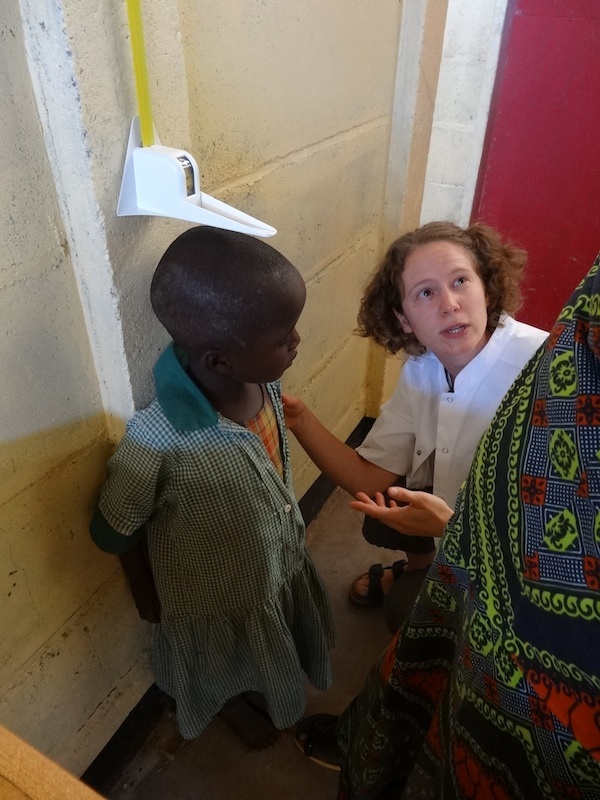 Malin Hammarström, our volunteer in September, busy measuring and screening the school children! 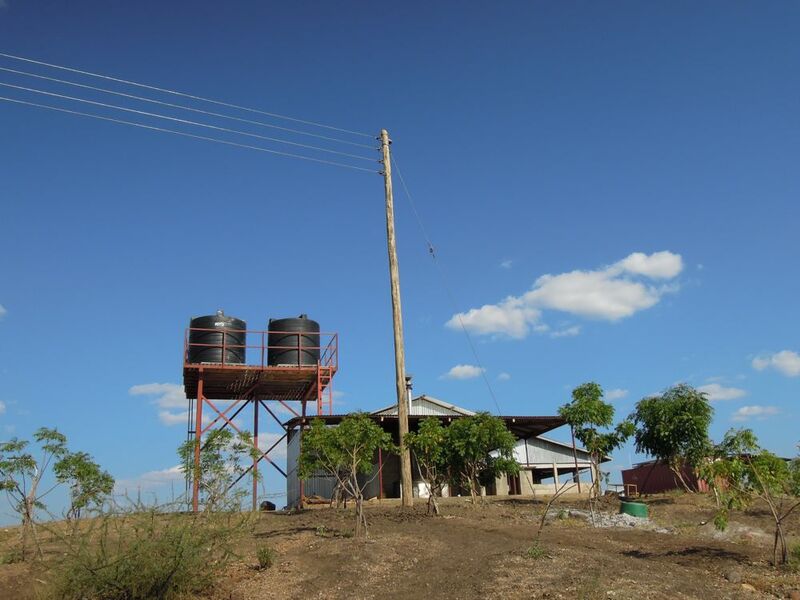 City electrical power lines now reaching the school and installation works have begun in order to have electricity available for lighting, wall outlets etc. 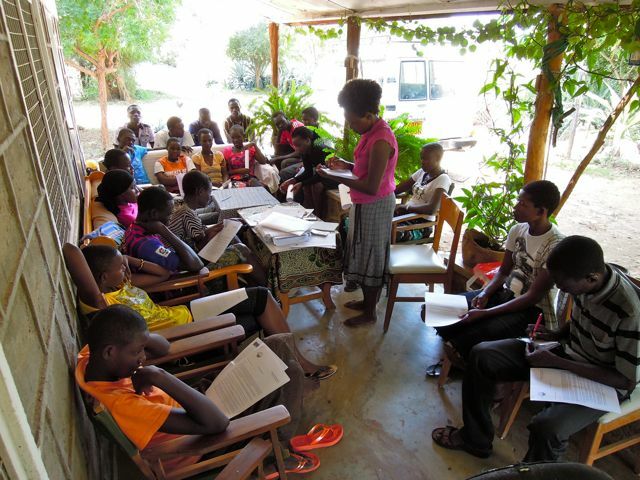 Maureen with our sponsored high school and university students. In total 25 of them. 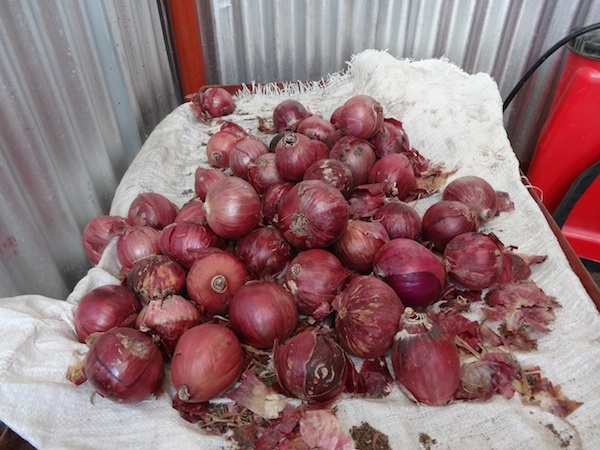 – Thanks to all of you helping these young Kenyans get through higher education! Loki is no longer a permanent base for MAF planes and MAF pilots – most organizations have moved to South Sudan. And so has MAF to its base in Juba. 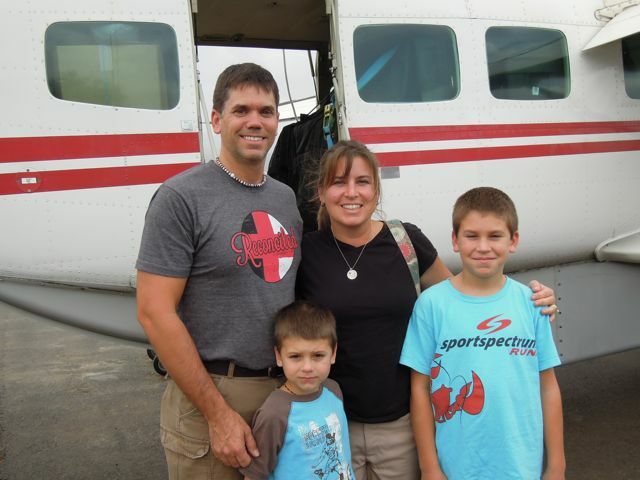 The Lewis family from the USA, on their way to their mission work in Kapoeta in South Sudan, they know how important the MAF lifeline is! And these wonderful children at our school!